Psst! 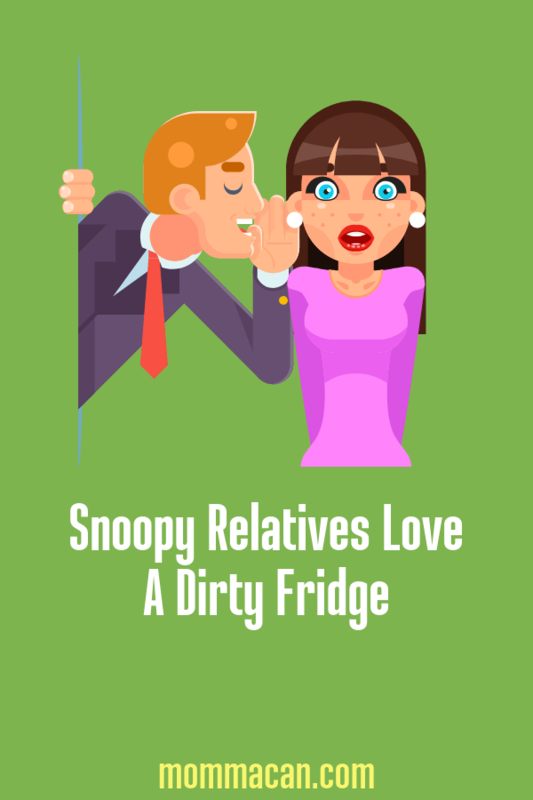 Snoopy Relatives Love A Dirty Fridge! 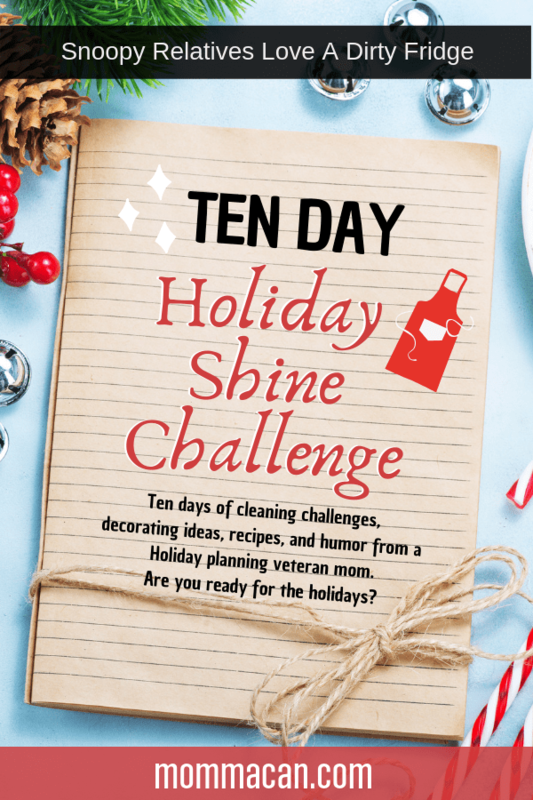 Our holiday cleaning challenge was created to just clear and clean out any areas that your nosy neighbors and snoopy relatives will love chatting about over wine and eggnog during your holiday celebrations! Join us! Today we are cleaning out the refrigerator! The one place that is truly nasty, that I think our excellent Nosy Neighbors and Snoopy Relatives will notice and get their tongues a-wagging is a refrigerator. There is nothing that can turn on a tattling tongue like a dirty refrigerator. It’s all hogwash, but some folks think if there is a bit of a spill here and there and some funky thing growing in the vegetable drawers that moms are not keeping a tidy house. Just the emails and phone calls alone can sometimes take up to an hour a day to get through, much less, taking care of the kids, trying to volunteer enough to make up for the cut back in school’s funding for like EVERYTHING, and oh, Lordy I had better stop or I may pop a blood vein. 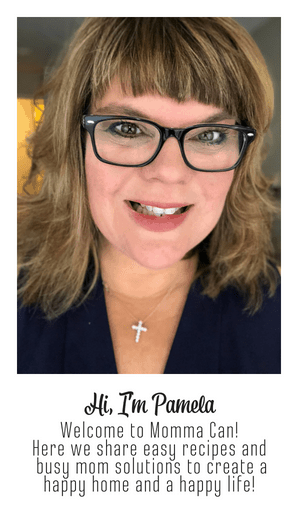 Some mammas do all of it and hold a full-time job! Wow, I work part-time, and sometimes I feel like a crazed loon and act like one as well. Food safe cleaner or just a spray bottle of 1/4 vinegar to 3/4 water. Favorite Stainless Steel cleaner for the outside if needed. Turn on three groovy tunes or set your kitchen timer for 10 minutes. Just wipe down the shelves, bins and anything else that is icky, make your fridge shine inside and out. Use your favorite stainless steel cleaner or more of the mixture to shine the outside. Now, later this week the fridge might now be clean again but, do not obsess I have a little trick to help you. Fill up the fridge, even if it’s just milk jugs, juice, and water bottles. This will hide anything that appears after our little clean-up. Usually, the refrigerator ends up full when the company is coming over anyway, but just to be safe fill it up. I do this a lot! Just do a quick clean once every other week and not so bad in the end!